Starting the Week Off Right- GGG 1st Giveaway! In addition to sharing green tips, I’m now in a fun place where I can share some of my favorite green items! We’re starting off small, but have even more great green gifts coming down the line this fall. For our first giveaway we have two sets (2 in each set) of awesome on-the-go alternatives to paper towels, PeopleTowels. I use mine ALL the time, as a place to dry my hands in the kitchen, bathroom at work, and as a napkin/spill remedy (I spill a lot…). PeopleTowels are not only absorbant, convenient, and colorful, they are also 100% Organic cotton (thus compostable) and Fair Trade Certified (my favorite certification!). 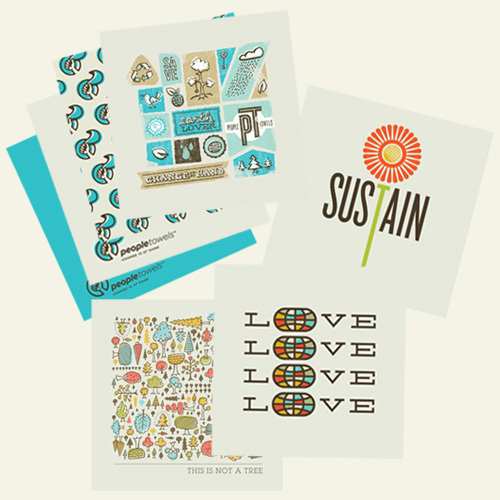 I am giving away two of these PeopleTowels 2 Packs (in Sustain, Not a Tree, Blue, and Celebrate Earth Day Everyday prints). To enter: tweet this article and let me know the one simple step you are going to take this September to be green. Make sure to cc @Gudergoesgreen! No Twitter? Then post a comment with your simple green step below. I’ll announce a winner by Sept. 1!